With Electric Vehicle (EV) registrations starting to rise, infrastructure to support them is also growing. For contractors, this growth offers the opportunity to get on board at an early stage, with a revenue stream that can only develop as more of these vehicles take to the road. The Department for Transport (DfT) vehicle licensing statistics show that between April and June 2016, 9,657 Ultra Low Emission Vehicles were registered for the first time. While that only represents 1.1% of all new registrations over that period, it is 48% higher than in the previous period in 2015, and 253% higher than two years ago. In reporting these figures, the DfT ascribes the growth to a number of factors: new and more appealing models coming onto the market, and increasing price competitiveness allied with the Government’s plug-in grant incentive. Plug-in grants, now available until at least 2018, offer a grant of 35% of the full purchase price of a car and 20% of the cost of a van (up to a maximum grant of £8,000). With more EVs on the roads, it is self-evident that the infrastructure to support them must be growing accordingly. Analysis carried out by car manufacturer Nissan indicates that by August 2020, the number of public EV charging points will grow to 7,900 while the number of fuel stations will have declined to below that figure by the same time – with the crossover point coming sooner with the accelerating rate of EV sales. While recent Government survey data indicates that around 80% of EV charging will be done at home or at work there are strong incentives for more public spaces to invest in charging points to help boost the uptake of EVs which, after all, play a strong part in the Government’s green agenda. Some local authorities are already installing charging points which are free-to-use for two hours. In addition, 98% of motorway service stations have charging stations and some local authorities are already including them as a planning requirement in both private and public developments. 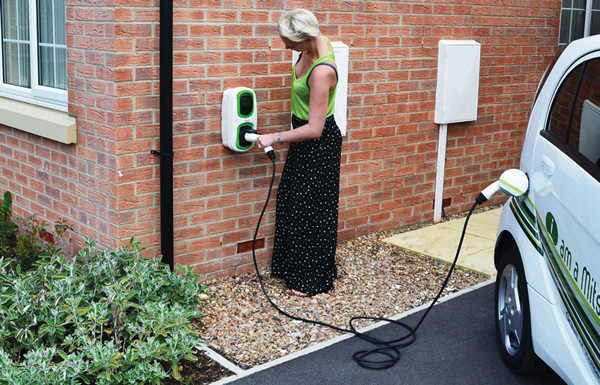 Homeowners can already take advantage of the electric vehicle homecharge scheme which will pay for up to 75% of the total costs of installing a home charge point fitted by an accredited installer. For electrical contractors, what all this points to is a new revenue stream – one that they should be taking on board sooner rather than later. It’s much better to be part of a market in its growth stage than try to elbow in when it has reached maturity. There are just two essentials for businesses wanting to become part of this market; basic training and a partnership with a reliable wholesaler offering a comprehensive range of charging point equipment. In terms of training, a good recommendation is the introductory EV charging course offered by NCEIC, which is designed to teach contractors how to install EV charging points in compliance with BS 7671, the Electrical Safety Quality and Continuity Regulations and the IET Code of Practice. It is a one-day course and an ideal entry point. On the equipment side, Newey & Eyre has invested in developing a range of charge points and accessories compatible with all the leading manufacturers’ electric vehicles, for either J1772 or IEC62196 connections. The Newlec range provides solutions for domestic, commercial locations and public charge points. Domestic products include the Newlec Wall-Pod, an EV-ready unit which offers a low-cost, future proof solution, not only charging in Mode 2 format but doubling as an outdoor IP65 rated domestic 13amp maintenance socket. It is also easily upgradeable to the full Mode 3 fast charging format. In the commercial sector, where chargers are subject to more frequent use, robust design and optimised security is key. For this, we developed the Newlec EV SecuriCharge, a heavy duty, hard wearing and vandal resistant wall mounted EV charging unit, designed and manufactured for public facing and exposed locations. It meets the full breadth of charging requirements from the majority of car manufacturers and is also easy to install and maintain. It’s compliant with all EVs and PHEVs, manufactured in compliance with BS7671 Wiring Regulations. Also for commercial and public sector use is the BasicCharge. This 1000mm high EV charging pedestal with a 4W light has been designed with mode 3 charging, a tethered cable or an IEC 62196 type 2 dedicated socket outlet, and built-in overload and fault current protection for added safety. By offering an EV charging point installation service, contractors have the opportunity not only to add an income stream to their business but also to help drive the development of the infrastructure that will see use of EVs increase, to the benefit of our environment. Contractors could also think of leading by example by installing their own charging points and taking advantage of the Government EV purchasing incentive themselves when replacing fleet vans. It’s a pretty compelling argument when talking to customers about the advantages of switching to EVs when you can say you’ve already done it yourself.